I ordered a cup of this tea at a cafe, and then immediately ran across the street after the meal to buy a box. It's just really, really good. It's very tart; I think most drinkers would prefer it with a teaspoon of honey. I enjoy it plain, but then, I eat lemon and lime slices like orange slices. To me it tastes very much like "summer" or "warm tropical places," which is the kind of vague description that covers citrusy, natural teas. It's a very real, natural flavor; none of that fake lime flavor, just real citrus, which makes sense, as the only ingredient is "dried lime." Organic, natural, one-ingredient: this tisane is lime and that's it. Basically, if you love lemon or lime, it's a good drink for you. If you're not a huge citrus fan, you're probably off making it with more sugar than your usual tea, or blending it with another tea to mitigate the citrus-sour. 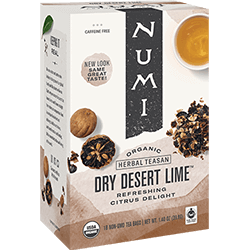 As an herbal tea, it's caffeine free, yet it's a great pick-me-up thanks to the bright flavor. Good for afternoons if you're trying to avoid more caffeine, or for anyone who is cutting back on the caff. Also a good starter tea, especially if you like lemonades. Pretty much the only people who I wouldn't recommend it for would be those who are sensitive to tartness and those who aren't citrus fans. As for me, I'll be keeping a box or two of this stocked on my own shelves from now on.